LynchyRightNow: The Lions Select . . . The Lions Select . . .
With an 0-16 record in the 2008 regular season, the Detroit Lions hold the #1 pick, in the 2009 NFL Draft. The Lions loyal fans, or what is left of them, are crossing their fingers and have just one sentiment: Please, do not draft Texas Tech All-World receiver, Michael Crabtree. The team that has drafted the worst over the last decade, finally has the number one spot, and in my mind the best player in the draft is yet again, a wide receiver. Over the past seven drafts, no team has drafted close to as bad as the Lions have. Seven top ten picks, four of them were receivers, one flop quarterback, one offensive tackle, and one undersized linebacker. In 2009, only three of those seven former draft picks, remain with the Lions. The choices the Lions have made, make the choices Pacman's made, look good. 1. Detroit Lions: Sam Bradford QB, Oklahoma Drafting quarterbacks #1 is always risky. For every Eli, Peyton, and Carson, there is a JaMarcus Russell, Alex Smith, and Tim Couch. You have to be sure he is a winner, you have to be sure he is physically NFL ready, and you better make sure he can read a playbook three times the size of the one he had in college. With that said, Georgia QB, Matt Stafford isn't your guy. He's got a big arm, like JaMarcus Russell, his team underperformed, probably because of hype, but even still, the Capital One bowl isn't acceptable for a team expected to play in the big dance. With Sam Bradford, here's a guy you know can throw the pigskin. He's a Heisman Memorial Trophy Winner, like Palmer, he can spread the ball out, and with a wideout like Calvin Johnson, Bradford would have an instant target. My question is still, what has Matt Stafford done for you? You don't have the personnel or the trading chips like Parcells had when he took over in Miami, so you can't afford to grab a tackle #1, it just doesn't fit. Joe Flacco and Matt Ryan have both excited GM's and disappointing teams, they now believe there is a chance they will be in the hunt in 2009, but slow down Detroit, that ain't you. Sam Bradford is two pounds lighter than Ryan and the same height. He's been threw a playbook of Bob Stoops, that is very similar to a pro style spread em' out offense, this isn't a guy playing with Knowshon Moreno in the backfield. The Lions have the Cowboys first round draft pick, they can make an impact with two picks, similar to what the Falcons did drafting Sam Baker later in the first round in 2008, and drafting Matt Ryan in the top three. I'm taking the guy who has proved he can play elite college football, rather than the guy who may have potential to be an established pro quarterback. 2. 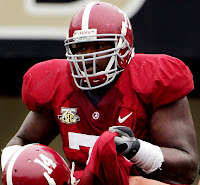 St. Louis Rams: Andre Smith OT, Alabama No brainer. We didn't get to see him play in the Sugar Bowl, but come to find out, his absence is what solidifies him being the #2 pick, maybe even the #1. With Smith on the shelf due to a rumored NCAA rules violation, the Crimson Tide and John Parker Wilson gave up the most sacks they had all season, eight. While All-American caliber back, Glen Coffee, had his lowest rushing total of the season, 38 yards, and led a rushing attack that averaged just 0.9 per carry, their fewest of the season. All due respect to the Utah and their undefeated season, but 'Bama was playing without a very, very, special player, and it showed. The team selecting Smith, would be the same team that was smart enough to take Orlando Pace twelve years ago as the #1 overall, Smith would be the heir apparent to Pace, a future hall of famer. The 6'4", 340 lb. offensive tackle is big and physical, like Jake Long in 2008, and Joe Thomas in 2007, Andre Smith is your #1 tackle available in this draft. The move also protects what is left of Marc Bulger and will rejuvenate Stephen Jackson, who is still one of the leagues premier backs. 3. Kansas City Chiefs Aaron Curry LB, Wake Forest On Tuesday morning, this pick just got a whole lot more interesting. One of the architects largely responsible for the dynasty that is the New England Patriots, vice president of player personnel Scott Pioli, is signed on with the Kansas City Chiefs. The man who found Tom Brady and Matt Cassel in the bottom barrels of the NFl draft, will not be taking a quarterback with the #3 pick. Oh no, not with a defense that was ranked 31st in the NFL in total yards allowed per game. Not with a defense led by 35-year old linebacker, Donnie Edwards. Considering what he just witnessed in New England with a defense led by old, long in the tooth, veteran linebackers in 2008. He's got a 25-year old quarterback in Brodie Croyle, who when healthy, has looked good. You fans waiting for a guy like Matt Stafford or Sam Bradford, don't hold your breath. Curry is a phenomenal athlete and pro scouts love him. 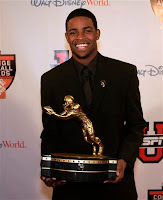 Voting him for the 2008 Butkus Award, given to the nations best collegiate linebacker, proves that. He's a good fit for the 3-4 defense, and I'm sure Pioli is well aware of what Aaron Curry brings to the table. This pick will be attached with the most rumours, just like picks have been in New England for the past decade. Given the success the Patriots had with rookie linebacker, Jerrod Mayo (defensive ROY), I'm confident Pioli would love a player like Curry, that is if he can't move the pick. Veteran Kansas City Chief TE, Tony Gonzalez, has already said he wants nothing to do with a rebuilding, and he is coming a career year in which he caught 96 balls for over 1,000 yards, the Chiefs may have some moves they can make. 4. Seattle Seahawks Michael Crabtree WR, Texas Tech Jim Mora Jr. era begins in Seattle. Will Matt Hasselbeck be back in 2009, and 2010? Either way, the Seahawks are in desperate need of an offensive playmaker. The only freshman to ever win the Biletnikoff Award for the nations top receiver, became the only two-time winner of that same award this past season. Michael Crabtree is, a playmaker. The two time All-American had by far the best freshman and sophomore years of any receiver in college football history. In his short time at Texas Tech he's amassed 3,127 yards and 41 touchdowns. 14, 100+ yard receiving games, including two games over 200 yards. Do you need more? He's had 231 career grabs at Texas Tech, in TWO YEARS I remind you. The 6'3" wideout will instantly improve the size and youth of the Seahawk receivers. Bobby Engram (36), Deion Branch (29), Koren Robinson (28) and Nate Burleson (27) are all smaller in height than the dominant Red Raider receiver. The 214 lb. receiver is all muscle, the same man who single handily stomped out the Texas Longhorns shot at a national championship can move with speed. Like I said in the lead, he's the best player in the entire draft. PERIOD. 5. Cleveland Browns Everette Brown DE/OLB, Florida State The Browns were only better against the run than three of four teams drafting ahead of them. The 28th ranked rush defense isn't winning you many games, and playing in a division with Pittsburgh and Baltimore, you better be able to stop the run. New head coach, Eric Mangini better attack that issue first. Brown is an outstanding pass rusher and has awesome speed off the edge, hence 13 sacks for the Seminoles in 2008. Alot of mock drafts have him dropping further in the draft, but I can't see the Browns staying in this spot and not drafting him, or Texas DE, Brian Orakpo. The idea that they would draft Ohio State CB, Malcolm Jenkins, is questionable at best, they have more urgent needs than him. In what time Brady Quinn was under center for the Browns their offense seemed to be able to move the ball, which makes correcting there defensive inabilities all that much more important. Mangini is going to have to find out what to do with Derek Anderson. Immediate need would be to draft a pass rusher who is quick enough seal off the outside to running backs. Again, the emerging play of both Baltimore and Pittsburgh makes everything more difficult as well. The Florida State defensive end added 20+ tackles for a loss this past season and has the ability to make big defensive stops. I like him more so than I do Orakpo. If your curious why we are Mock Drafting in January, just look at the teams left in the NFL playoffs; What else are we going to do? Talk about the Cardinals? BAM! You need KEEP IT REAL FRIDAY!